Leave extra time because the Chinese New Year Parade is from 6pm-8pm and some streets near YBCA close around 4pm. The Southwest Airlines Chinese New Year Parade begins at 5:15 pm at Second and Market Streets, proceeds west on Market to Kearny, north on Kearny to Post, west on Post to Powell, north on Powell to Sutter, east on Sutter back to Kearny, then to Columbus Avenue, where the parade will disperse. Streets along the route will close to traffic beginning at 5 p.m. and will reopen once the parade has passed and the route has been cleaned. Market Street between Second and Fremont Streets and Second Street between Market and Mission Streets will be closed beginning at 4 p.m. to accommodate the parade staging area. Market Street cross traffic will be allowed until 5 p.m.
For more information on Muni reroutes, click HERE. For more detailed information on the parade, visit their website. Our advice: Have a day in the city and arrive in the afternoon, join the parade to celebrate one of San Francisco’s biggest cultural events, grab some food in the area, and head to the show! Need a place for dinner or a drink before or after the show on Friday or Saturday night? Go to B Restaurant and Bar (just above the YBCA Theater) for some Flight-themed cocktails! 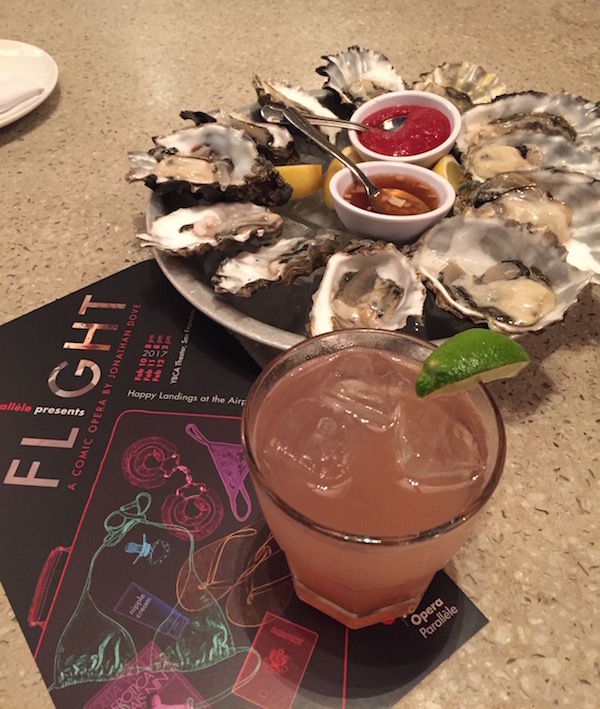 They also have a great Happy Hour every day with $1 oysters between 4:30-6:30, so get there early! Coming to the show on Sunday?